K.G. 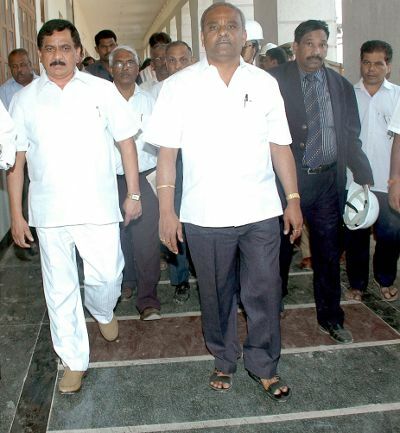 Bopaiah Speaker of the Karnataka Legislative Assembly said the monsoon session of the legislature will be held in the newly constructed Suvarna Soudha in Belgaum in July. The Speaker was here to review the work of the building and said that the work in progress is good and in one months time it should be ready. ha ha ha ..Nice one!!! It will be a proud moment to me and all my fellow Belagavikars to host the Leg. sessions in our city. I am sure Belagavi will see greater heights in the future and will further enhance its position as an important city of N. Karnataka-S.Maharashtra-Goa region. Starting of session in Suvarna Soudha will bring a ray of hope for Belgaumites for development as peoples in power will visit the Belgaum city & see the condition of Belgaum. Karnataka people already started calling Belgaum as second capital of Karnataka but they dont know that its only on paper but actual fact is something different. Recently I visited Hubli & Dharwad & I was bit surprised & shocked by seeing the kind of development work done in twin cities. I am not against the development of that cities but I feel sorry for Belgaum.for not considering for development.. In budget 2012-13, there is no any special provision for Belgaum. Hope some new projects are implemented this time.! !